In a fishing village, a young woman named Senta becomes infatuated with the story of the Flying Dutchman, a sea captain condemned to sail for eternity. Legend has it that he has been cursed by Satan, and can return to land only once every seven years, to search for a true love that will release him from his suffering. When a ghostly ship anchors near her town’s harbour, Senta's fantasies collide with reality in a powerful, storm-tossed encounter. Friday, May 1 at 7:30 p.m.
Wednesday, May 6 at 7:30 p.m.
Tuesday, May 12 at 7:30 p.m.
Saturday, May 16 at 4:30 p.m. Performance time is approximately two hours and 20 minutes, with no intermission. The Dutchman is a doomed sailor cursed to sail the seas without respite, only able to set foot on shore for one day every seven years. If he can find a woman on that day who will vow to love him until death, his curse will be broken. 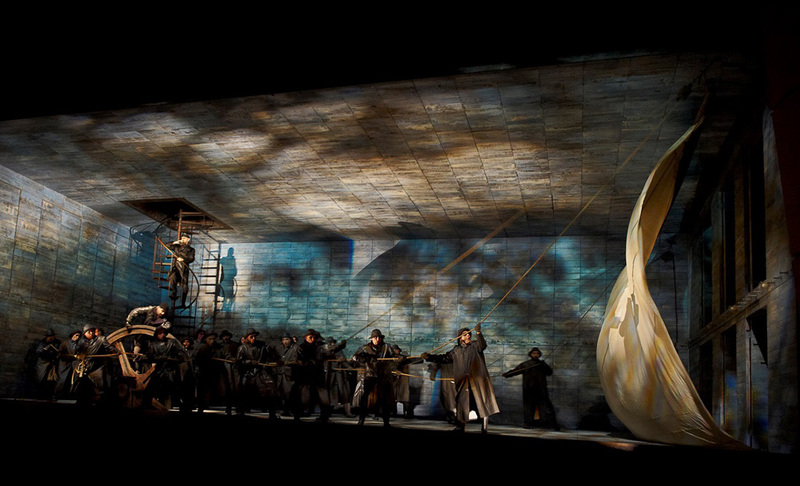 The Dutchman meets Senta, who falls in love with him. But when her former suitor threatens the pact, she proves her love by sacrificing herself, and thus saving both her soul and that of the Dutchman. Daland, a sea-captain, drops anchor near his home harbour, and orders the Steersman to keep watch. The tired man falls asleep and fails to see the arrival of the Dutchman’s ship, which anchors beside Daland’s vessel. When Daland discovers the strange ship he calls to its captain, who identifies himself simply as “a Dutchman” and offers a rich reward for one night’s lodging. He then offers his fabulous treasure as a dowry for the hand of Daland’s daughter, and Daland eagerly agrees. Daland’s daughter, Senta, stares at a portrait of the Flying Dutchman while the women around her sing as they work. Senta then sings a song about the Dutchman, a sea-captain condemned by Satan to sail for eternity. He is permitted to set foot on land only once every seven years, to search for salvation in a woman’s love. Mary, Senta’s companion, scolds Senta for her obsession with this legend, and tells her that when her father returns, she will ask him to remove from the house the picture of the Dutchman. Erik, Senta’s suitor, enters to say that he has seen her father’s ship sailing towards harbour. He presses her to ask her father to give him her hand. Senta, however, continues to speak of her fascination with the Flying Dutchman, and Erik tells her of a dream in which he saw her embrace a strange seaman. In despair, Erik leaves. After a party of celebrating sailors and their women are terrified by an encounter with the Dutchman’s ghostly crew, Erik and Senta enter. Erik is angry, as he has learned that Senta has accepted the hand of the Dutchman. As Erik reminds Senta of her promise to love him, the Dutchman enters and overhears the exchange. Convinced that Senta is Here are the set sail. Proclaiming her eternal faithfulness to the Dutchman, Senta dies. This production will be performed without intermission. 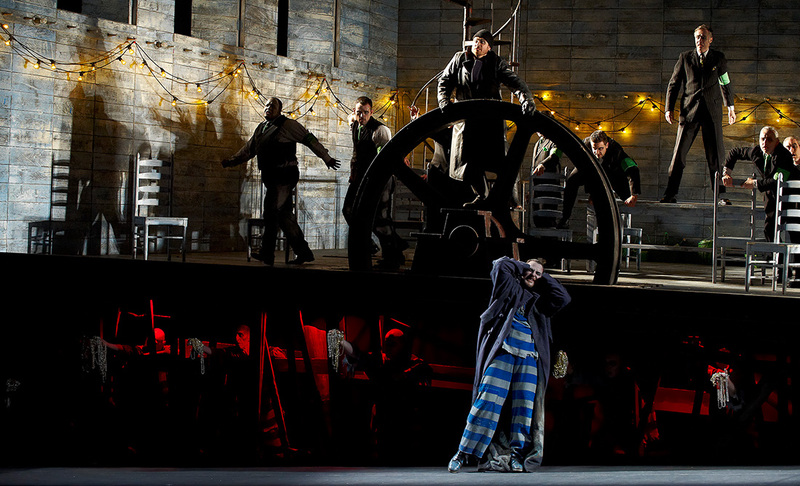 Production photos from Canadian Opera Company’s The Flying Dutchman, 2010; Adam Luther (at wheel) as The Steersman and Evgeny Nikitin as The Dutchman, All photos: Michael Cooper.